May 22: Canada Sport For Life with Dave Ellis, Mark Baxendale & Jordan Petrovics. 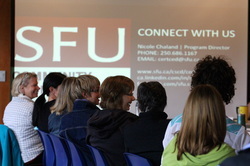 June 3-7: SFU CED Courses in Golden with Nicole Chaland, Sean Markey & Michael H. Shuman. July 13: What is a Trails Alliance? with Stewart Spooner, Kootenay Columbia Trails Society. July 15: Health & Social Service Groups - Food Bank Sustainability with Barb Davies, Golden Food Bank Society. July 22: Connecting Communities & People Through Trails with Al Skucas, Trails BC. 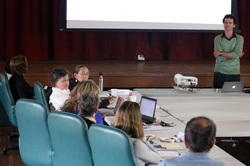 July 30: GCRS Team Meeting - Community Coordination project with Ryan Watmough. July 30: Faith-Based Organizations (Christian) with Ryan Watmough. August: Seniors Organizations in Golden with Barb Davies & Ryan Watmough. September: Directors & Officers Liability with Glen Ewan. September: Funders Forum with Golden & Area A Funders. September 12: Community Connection Night, 6-8pm, Mt. 7 Rec Plex. September 24: What is a Social Development Coordinator? with Jill Zacharias, City of Revelstoke; noon & 1:15pm. 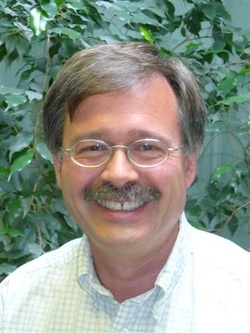 October 24: Columbia River Greenways Trails Alliance with Mark Halwa, Chair. 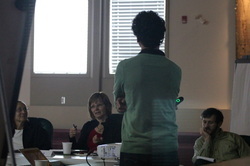 October: BC Labour Market Partnership Project - Social Services Advisory Committee with Jen Stuart, Vancouver Foundation. October: Kootenay Boundary Community Services Cooperative/REACH with Eva Hernandez. Golden & Area A hosted three courses of SFU’s CED certificate in a week long intensive summer studies from June 3-7, 2013. The three courses included: Sustainability of People, Planet and Places, Locanomics: Introduction to Local Living Economies and Emerging Economic Theories & Practices. CED is a community-centered process that blends social and economic development to promote the economic, social, cultural and ecological well being of communities. CED encourages using local resources to create economic opportunities, and at the same time, improve social conditions in a sustainable way. 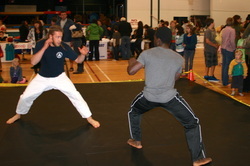 Course instructors are experts in their particular field and will be coming from Vancouver and Washington, DC. Over 20 participants attended the courses, with 15 from Golden & Area A. The largest bursaries in the history of the SFU CED program were made available from the Golden & District Community Foundation. Additional support was provided by Columbia Basin Trust, Columbia Valley Credit Union, Columbia Wetlands Adventures and the Prestige Inn Golden. During that intense week, there were evening activities for the public like a film showing of The Economics of Happiness at the Golden Youth Centre and piggybacking with KRIC's Basin Business Blender at the College of the Rockies. By the end of the week 5 of 8 local elected officials and the CAO of the Town of Golden had met or listened in on the lectures. Course participants also participated in Golden's first ever "Cash Mob" at Bacchus Books and experienced the Columbia River with Columbia Wetlands Adventures. Throughout the summer, course participants and instructors will be working through individual CED initiatives together, making a lasting impact on Golden & Area A. The SFU CED was included as a key part of the Community Coordination project because it brings together a critical mass of local leaders and up and coming leaders, provides a common language and methodologies that they can use when addressing local community, economic, social and environmental issues. On May 22, Ryan Watmough was invited to present at the CBT-sponsored Canadian Sport 4 Life event at the Golden Civic Centre with keynote speaker, Dave Ellis. The short presentation, in between Mark Baxendale & Jordan Petrovics talks, outlined the more general Community Coordination project and how local sports organizations could informally continue to work together and fit into the possible Community Team Models. We have met with Jordan Petrovics, Manager of Recreation at the Town of Golden, and look forward to exploring future opportunities to facilitate communication, cooperation, collaboration and consolidation where willing. At the "ground level," the community has a very active Golden Cycling Club. In recent years, this club has turned from hosting the world-famous Mount 7 Psychosis to building the Moonraker Trail System on the West Bench. Each year the trail network expands as they find more members and more funding opportunities. Never to play 2nd fiddle in the fundraising game, the Golden Nordic Ski Club has just completed a $1M lodge for when the snow flies and has successfully hosted the Canadian Masters in 2011. Meanwhile the Golden Snowmobile Trail Society has just built a trail from the Gorman Lake Parking Lot to Quartz Creek. If there is interest from the above mentioned user groups (and many others not mentioned), a trails coalition can help to develop long-term plans, address access, trail head and maintenance issues and secure core funding through local government and industry. 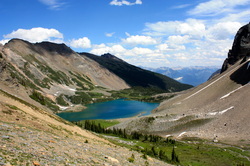 In the summer of 2013, the Community Coordination project hopes to bring in representatives from Trails BC, the Trans Canada Trail and the Kootenay Columbia Trails Society to share ideas and see if there is interest in bringing these many local groups together to provide better opportunities for all. · How do you want to be engaged in community affairs? · What does quality of life mean for you? · How do we increase voter turn-out? Hear others’ points of view, share your own opinions and have them heard, all in a lively, fast-moving format. Your elected officials will be participating and listening, and meeting results will be summarized to help them with future decisions. Community Conversations start Wednesday, October 23rd at the Civic Centre, 810 10th Ave. S. (Highway 95 S.) at 12:10 p.m. Bring a bag lunch (or, if you forget, pick up one at cost from our limited supply). Bring a friend, bring your creativity and inspiration, and join the conversation! Wouldn't it be great if there was a place one could bring your ideas to grow and earn interest and be withdrawn once matured? That's what the Banff Ideas Bank is all about. "It has often been said that we don’t make progress in our personal life, workplace or community by standing on the sidelines complaining, but we do progress when we generously offer up our time, energy and creative ideas. 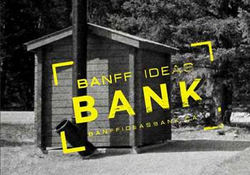 It is our intent at the Banff Ideas Bank to introduce “Ideas” as a new currency for our community in 2013. While no one suggests that Golden needs to create their own Ideas Bank, the community can improve how it discusses ideas and solves issues. One of the founders of the Banff Ideas Bank (and former Golden resident), Kim Bater will be coming to Golden in October. This well-attended course is being offered again this year. Glen Ewan, Q.C., will discuss the legal duties and potential personal liability of directors of Clubs, Associations and other Societies. This is a must course for everyone volunteering with their favourite non-profit group. Note: Although there is no charge for this workshop, it is most important that students pre-register with the College of the Rockies (COTR) - Golden Campus (250-344-5901) to guarantee space availability, and to ensure that the workshop will run. And Mr. Ewan will be offering free Writing Your Will workshop. 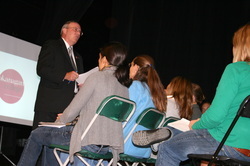 This must take workshop with facilitator Glen Ewan, Q.C., outlines the basic aspects of planning and writing your Will. Topics include information that should be contained in a Will, what property can be disposed of in the Will, what makes a Will valid, how a Will is revoked or changed, the importance of appointing guardians of minor children, and what happens if you die without a Will. Note: Although there is no charge for this workshop, it is most important that students pre-register to guarantee space availability, and to ensure that the workshop will run. Register through the COTR. Finally, Mr. Ewan will offer Conducting a Meeting workshop at the College of the Rockies to provide clarity on how motions are put forward and voted on, as well as how to adjourn a meeting. Following the success of the 2010 Funders Forum, a 2013 Funders Forum was held in Golden in the fall. Rather than a public presentation to grant applicants, this event will provide a chance for local groups to get together and share their successes and challenges in serving the great community. It is hoped that through this event and subsequent work, funding gaps and overlap will be reduced and all funding resources will be stretched further to address community priorities. Martha Rans, from Law Share will be coming to Golden and the Columbia Basin on October 29, 2013. Details to follow. Are you an "accidental fundraiser"? If you find yourself in that role with little training or experience, this workshop is for you. This fun, interactive one-day workshop will help you: Learn how to raise money and enjoy yourself in the process. Build your confidence and enhance your fundraising skills. Learn how to get unrestricted funding for your core organizational needs. Understand donor behaviour and how to motivate donors. Figure out the correct mix of fundrais-ing strategies for your organization. Using games, examples, and interactive exercises you will learn to shed your fears and become an enthusiastic and effective fundraiser for your cause. Are you working for a non-profit organization? Or volunteering your time as a board member? Wonder if your organization could use a refresher on common legal pitfalls and best practices to stay out of them? These workshops are FREE, however space is limited, register online now at www.basinreach.ca. October 29, 2013; 8:30 am – 4:30 pm; Golden, BC. *This is a project of The Kootenay Boundary Community Services Cooperative with funding provided by: Columbia Basin Trust and The Law Foundation of British Columbia. Eva Hernandez, REACH, www.thekoop.ca, will be coming to Golden and the Columbia Basin this fall. Details to follow. Nancy Gale, Executive Director of the Cariboo Chilcotin Child Development Centre Association has offered to share her experience with acquiring and developing non profit spaces. The CDC has operated continuously since 1975 and provides assessments, treatment, education and assistance to children with special needs and their families. 622 children and their families in the Williams Lake area received 962 services from the CDC in 2011/12. Nancy is a member of the BC Social Services Advisory Committee. 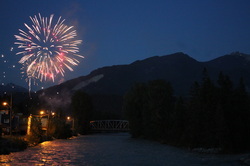 This annual event is organized by the Town of Golden and scheduled for September 12 at the Mt. Rec Plex. Make sure your organization registers for this community group trade show-style event and take in the many demonstrations like the one pictured here. Contact Jordan Petrovics and Kim Bryan at the Town of Golden for more information. While nothing is confirmed at this point, Dr. Sean Markey, from SFU, has offered the opportunity to have Masters level planning students participate in a Golden-based planning project. Details will be worked out in the summer for a fall start date.